If you like snarky humor and watching a train wreck of a family unravel at the seams then I’ve got another great book to add to your summer reading list! First of all, the title/cover combination is pure gold, this is a great book to pick up this summer. It’s light, but has a bite due to its sardonic nature. This is a modern, cynical look at the dynamics of a highly dysfunctional family that could not be more entertaining. It’s told via alternating points of view, primarily through the eyes of Paul, Alice and Donna though you do hear from just about every character at some point. Every single one of them is deeply flawed and not very likable, but watching their relationships was utterly fascinating. These people do not hold anything back, they are brutally honest and at times it’s painfully awkward, but again absolutely entertaining as a reader. This has some racy, risqué scenes but it’s also infused with the type of humor that speaks to my soul. The writing is acerbic, intelligent and scarily insightful and is always filled with snark. It’s really witty and engaging, I read it pretty quick and can’t tell you how many times I vacillitated between giggling and being horrified. The way this family behaves is appalling! I think the book succeeded at what The Nest tried (and failed) to do. If I had one (minor) issue it would be that there was very little time at the wedding and I’m a sucker for drama at a wedding! 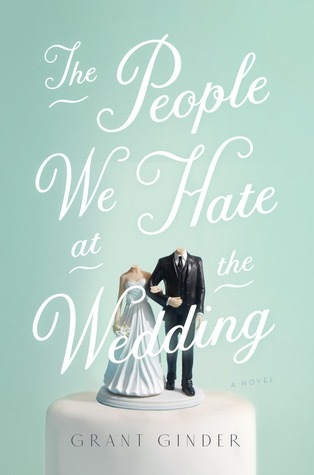 At the end of the day though, this book isn’t really about a wedding, it’s about a really messed up family, so I’m not mad. Thanks to Flatiron Books for my review copy. I have to say I was really looking forward to wedding drama as well so I’m bummed to hear there’s not a lot. I’m enjoying the writing style so far though. Great review! Honestly there’s enough other drama that makes it worth the read!